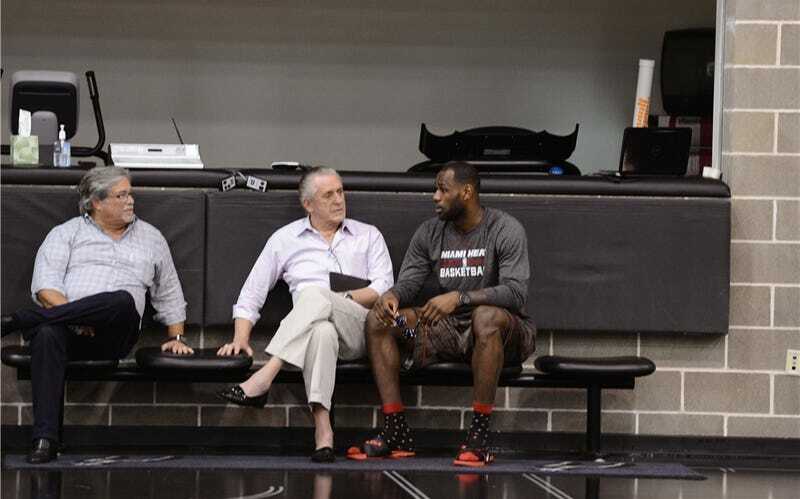 Pat Riley Says The Heat "Don't Need To Rebuild"
The biggest question of the NBA offseason will be what becomes of the Miami Heat, who obviously cannot challenge again with LeBron James, Dwyane Wade's corpse, Chris Bosh (who is good and whatever but making a shitload of money), and the rest of the crap roster. It was perhaps Pat Riley's biggest coup getting them together; it'll be harder to find a successful exit strategy. Riley, who rarely talks to the media, held his annual season-ending press conference today, and was his usual expansive self. With just one player—Norris Cole—guaranteed to be under contract next year, Riley owned up to the fact that his biggest challenge is what to do with Miami's Big Three, each of whom can opt out of the final two years of their deals. "I don't think we've got to recruit Chris, Dwyane or LeBron," Riley said, and then made a reference to his first meetings with James and Bosh, in which he reportedly let them handle his then-seven championship rings. "I'm not dropping rings on the table for those guys. They could drop their own." Of course, it's more than just convincing those three to opt in. Barring the greatest front office summer of all time (it took the Spurs three-plus years to put together their complementary pieces), these Heat can't afford to add much quality unless the Big Three are willing to take pay cuts. The quick fix, should Miami's stars be willing to create cap room, would be to add another max-type guy. Say, Carmelo Anthony. "That's a pipe dream," Riley said, without mentioning the name of a potentially targeted player. "But everyone thought 2010 was a pipe dream. That's not where we're headed." No, Riley made perfectly clear what he told his players during their exit interviews. That if Miami's Big Three want a second act, they're going to need to take a page from the Spurs' Big Three, and tough it out. Even if it takes a few years. "You've got to stay together, if you've got the guts," Riley said. "You don't find the first door and run out of it if you have an opportunity. This is four years now into this era, this team. Four finals - it's only been done three other times before - and two championships. From day one to the end, it was like a Broadway show. It sort of ran out of steam. And we need to retool. We don't need to rebuild. We need to retool. "And that's what we're going to do."